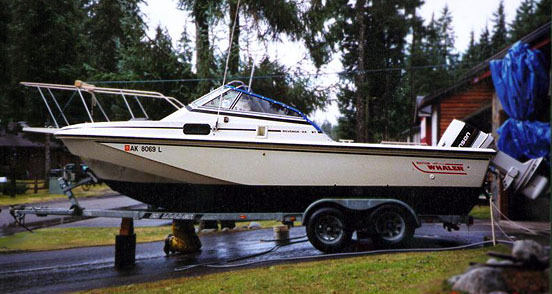 "I have a 1990 22-ft Revenge with a 225-HP Johnson and 9.9-HP Yamaha 4-stroke kicker. Great boat. She's my third Whaler (13-foot 1966-1981, 17-foot Montauk 1988-1996, 22-ft Revenge 1997-present). 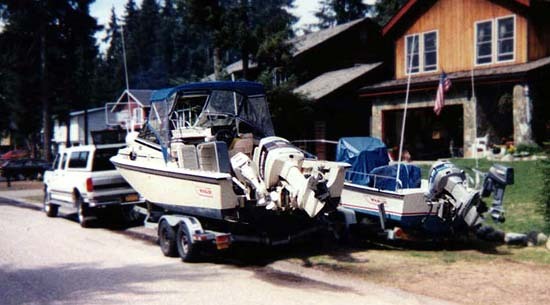 "In 1988 I bought my 17-foot Montauk on Eastern Long Island, New York. I was in the Coast Guard then and in 1989 we got transferred to Kodiak, Alaska. I had a '87 Chevy Suburban with a 6.2L diesel. I towed the Montauk cross country to Prince Rupert, British Columbia, then took the Alaska State Ferry TAKU to Haines, Alaska, then a 660 mile drive to Fairbanks (to visit my wife's family), then another 600 mile drive to Homer, Alaska, then a 120 mile ferryboat ride to Kodiak aboard the State Ferry TUSTUMENA. 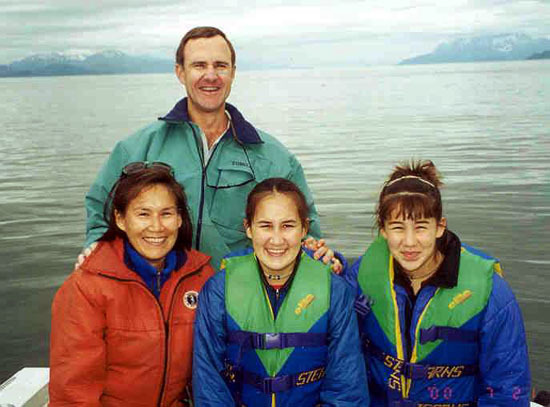 In 1992, we got transferred to Juneau and we reversed our travels, going to Juneau, Alaska via two ferries and 1,260 miles of towing. I retired last summer (2000). "Of note, you can see the Wm. J. Mills & Co. of Greenport, NY, cockpit cover. I ordered it two years ago. As one of your other photo stories stated, they have canvas for all the Whalers. And they fit right out of the box (they even included spare snaps!). I've been to Mills in Greenport, and they're a quality outfit. "May be hard to see in the pictures, but I got rid of my magnetic compass and got an electronic fluxgate compass from Skipper Marine (Ritchie Mag One). Compass deviation is removed by making two complete 360-degree turns and you're all set. Now my LORAN, GPS, and compass all agree within 1-degree of heading (most of the time). And another shocker, LORAN, GPS, and fathometer usually agree to 0.1 or 0.2 knots in speed. "Note the Port and Starboard fish boxes. I made them out of 3/4-inch plywood (a garage winter project). The Starboard box holds a cooler (without the top), and the hinges are so I can slide the cooler out. With the cooler temperatures up here, ice will last all day with the wooden top. The port box holds gear. Not perfect, but functional and they don't slide around. "You may notice a lot of references to North Pass outside Juneau. This is an excellent salmon fishing area and humpback whales are almost always present. "Where's all the snow?!?! Alaska in the summer? Some of the best boating in the world! Juneau's snow fall is inconsistent: 214 inches in '94-'95, only 31 inches last year. Makes it tough to winterize--I use multiple covers with wood and pvc pipes for framing. 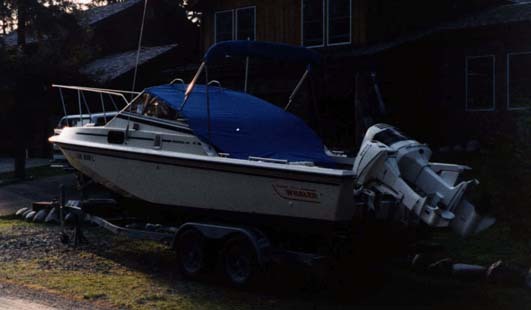 Some people just leave their boats uncovered--and in the spring it looks like it! "Great web site. You're welcome to use the pictures." 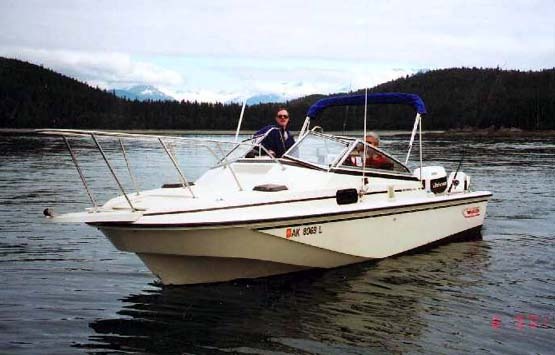 The 1990 Boston Whaler 22 Revenge Walk-Through KELSEY J cruises nicely on plane in the North Pass, outside of Juneau, Alaska. That unmistakable curve of the chine lines under the bow announces clearly there is a Classic Boston Whaler approaching. We get a better look at the Revenge model, formed by adding the topside superstructure mold to an OUTRAGE hull. 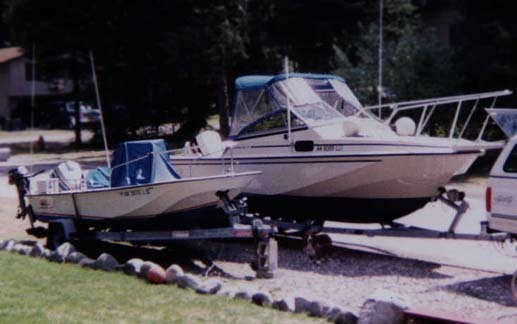 This 1990 model features all the refinements, including the bow sprit option and bow pulpit railings. By the way, I had no idea it was so green in Alaska! The classic Bob Dougherty designed 22-foot hull likes to cruise along on plane with this nice bow-up trim, taking the chop on the aft half of the moderate vee hull. 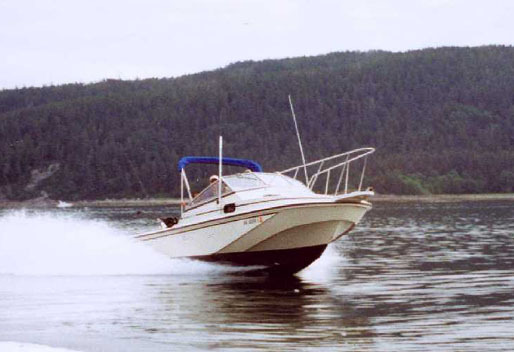 This same hull shape is still used in the 22-Guardian from the Commercial Products Division. The Wm. J. Mills & Co. Flying Top stows in the up position, supported by the stern poles. 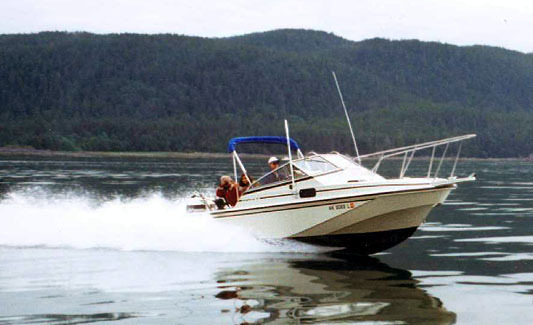 The 225-HP Johnson main engine and 9.9 HP Yamaha 4-stroke auxillary are hidden in the spray aft. 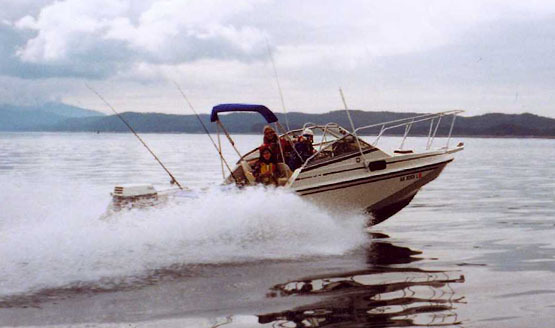 The Revenge series of boats varied over the years on how they accommodated passage to the bow. The Walk-Through model culminated the evolution with the opening center section of the windshield. Jim and Grandma Flora are seen here in Handtrollers Cove, new North Pass. And, finally, we see some snow on those mountains in the background! Should we look at the scenery or the boat? 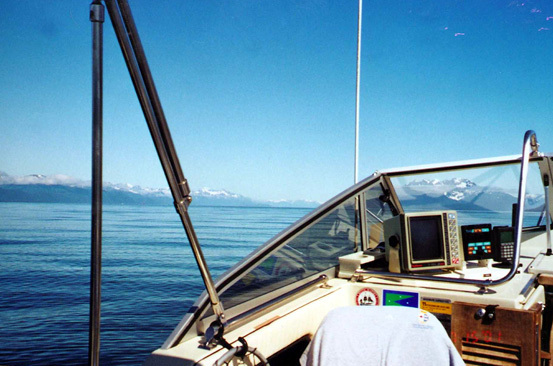 This beautiful view of Alaska's coastal mountains from Lynn Canal near Juneau also shows the very nice console space available in the Revenge-WT model. On Starboard this area is filled with the helm console, but on Port you have plenty of room for more electronics and gadgets, which here include a Raytheon fathometer, a NorthStar LORAN, and a Garmin GPS. This boat also has the optional railings to assist when going up and through the windshield. The walk-through center opening windshield makes getting on deck and going to the bow very simple. You can see the design of the railing, intended to provide great security to the crew on deck. Note there is even a step recessed into the windshield base molding. 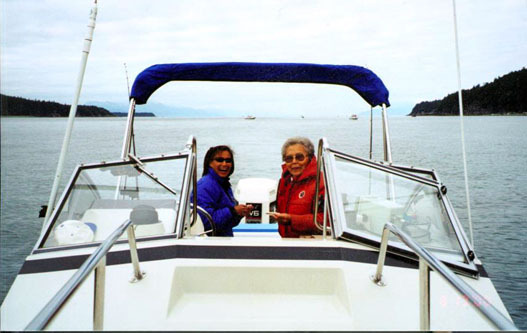 In the cockpit are Tamira and Grandma Flora, who are playing Scrabble® while boats astern fish for Silver Salmon in the North Pass outside Juneau. 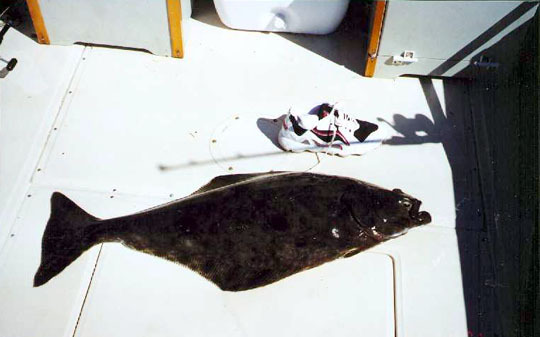 Successful fishing landed this 30-pound Halibut. Jim has built two storage boxes on either side of the cockpit. The 150-QT Igloo cooler normally stows aft, about where this picture was taken from. The 22-foot Revenge on a tandem axle trailer fills up most driveways. A Mills Pacific Blue Sunbrella Cover protects the cockpit. Where are all the igloos? This is supposed to be Alaska! Covering the cockpit of the Revenge is a bit of a challenge. The support poles for the Flying Top have to be accommodated, as do the tops of the twin railings at the windshield walk-through. This is more of Wm. J. Mills & Co.'s fine work with Pacific Blue Sunbrella fabric. Tamira, Jim, Weather Lee, and Kelsey James at the stern of the Revenge. Daughter Weather Lee is named after her Grandpa's 42-ft Post Sportfisherman on Eastern Long Island, New York. Kelsey James lent her name to their Boston Whaler. All four are wearing PFDs, not a bad idea when boating in open water, or really any water for that matter! 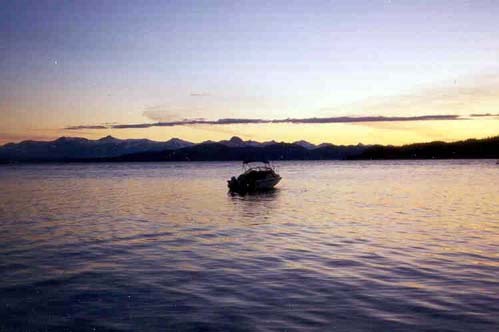 In 1997 the Kelsey J anchored for a night of camping on Couglan Island, Juneau, with the Chilkat Mountain range in the background. This side-by-side setting shows the relative sizes of the Revenge and the Montauk. Again, the relative sizes of the Revenge and the Montauk are seen in this view. The page has been accessed 41229 times.